I can bet the First Lady prays for a fairy godmother every night. 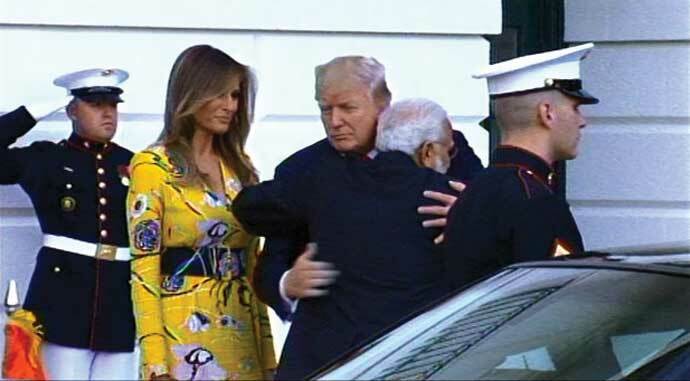 If I were part of Donald Trump's White House staff, I would have done my research and got a live orchestra to play The Blue Danube when Prime Minister Modi arrived at the White House and fell into President Trump's arms. 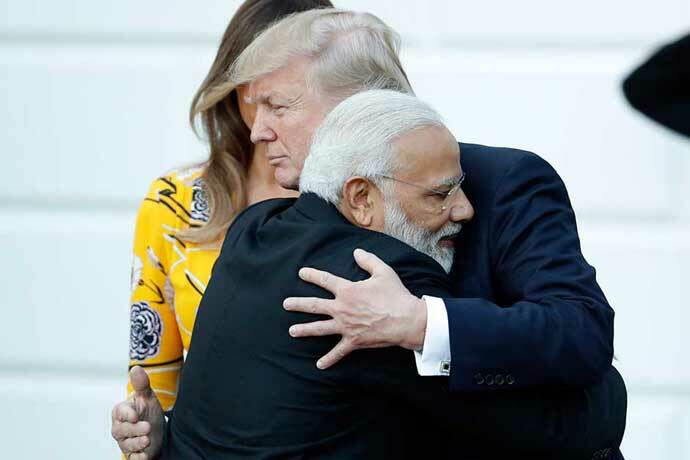 Because everyone (including the US media) has remarked on Modi's needy, never-let-me-go hugs. His hugs fall into the fierce grizzly bear category rather than cuddly teddy bear, and they turn into long, slow waltzes when the recipient politely tries to disentangle himself. And at that point, I would have instructed the orchestra to switch to Engelbert Humperdinck's, "Please release me, let me go". 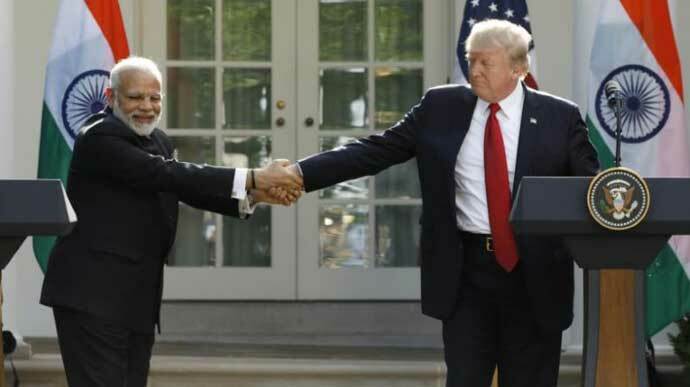 The orchestra would be on standby throughout the meeting, because Modi doesn't just hug once — he grabs his chance whenever possible. 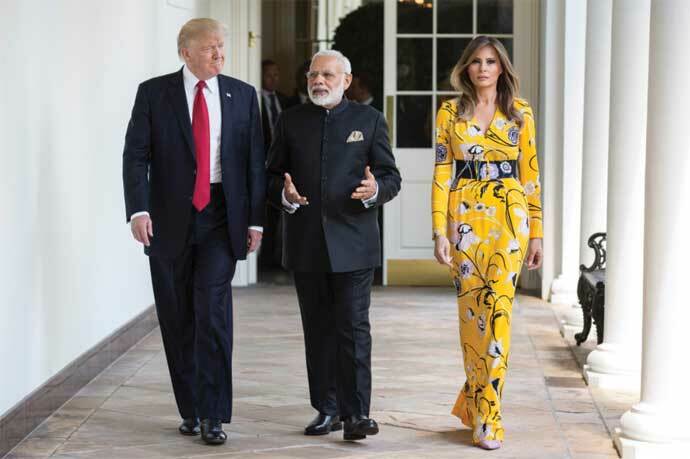 "You Should Be Dancing" from Saturday Night Fever should be in the orchestra's repertoire for when Modi feels the urge to yank the world leader towards him in a nifty, romantic jive move. 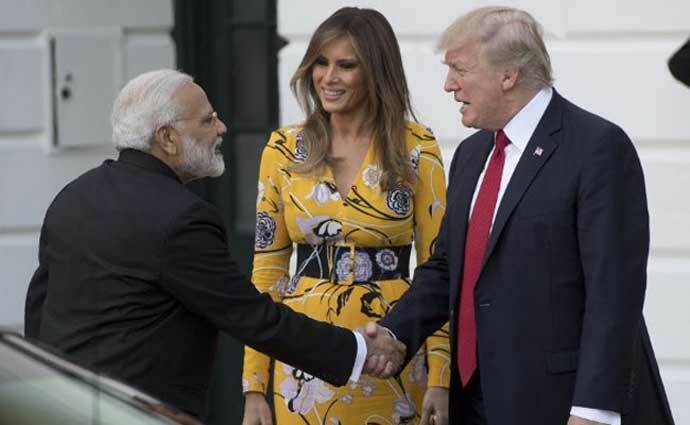 While most of us find Modi's how-often-have-you-hugged-a-world-leader-today actions amusing, Melania Trump flashed an odd smile when Modi lunged towards Trump yet again for a final, bye bye hug at the White House front door. Like Da Vinci's Mona Lisa, Melania's smiles are ambiguous — it's hard to tell if she's happy, sad or mad or just behaving like an East European Soviet-era heroine in a novel by a depressed Soviet-era East European. World Leader: How are you, Mr Modi? Indian Media: Wow, gosh, he really, truly cares about Modi -he asked how he was! He didn't ask "Eleven" Jinping that exact same question in that warm, gravelly tone of voice. Gasp. Wow. Gasp. Wow. Modi's a rock star! Melania looks like how you feel when boring relatives with accents you just don't get come for lunch but wheedle their way into staying for dinner and can't stop saying goodbye, not even when you finally manage to gently push them to the front door. They linger and linger and linger till you want to scream, "Get out!" Body language experts have made much out of one of Melania's equally indecipherable expressions at the inauguration ceremony of Donald Trump as the 45th President of the USA-it looked like she was totally pissed off. Media excitement hit new highs at Tel Aviv's Ben Gurion airport a few months later, when Trump reached for her hand and she slapped it away. If these experts are right, perhaps Melania has reached the end of her tether, and who can blame her really? I mean, would you like to live with a sexist, right wing, megalomaniac with a limited "this is good, that is bad" vocabulary? This is fair enough. While Melania may be the First Lady, it's Trump's daughter Ivanka who has been given all the glory and is in the spotlight more often. It's like Trump has turned Cinderella on its head and the step-mother has been reduced to doing the dull, housewifey chores. I can bet Melania prays for a fairy godmother every night. Yes, why? Have we ever seen footage of First Ladies receiving their friends at the White House? So not fair! When you overdo PDA, people do wonder. Keep it cool, Bro! Writer & cola-junkie. Marx & Macaulay are my mummy & daddy according to book-banner Dinanath Batra. Bigots/fascists (including Dinanath Batra) will be blocked.